The 2008 financial crisis and subsequent government intervention changed the complexion of the U.S. bond market. In 2007, U.S. Treasuries comprised 22% of the Bloomberg Barclays U.S. Aggregate Bond Index (the Agg) — that’s increased to 39% today. Factoring in debt issued by government agencies and mortgage-backed securities (MBS), the total government exposure in the Agg is now over 70%. The bond benchmark makes diversification a challenge. The index weightings do not foster diversification. 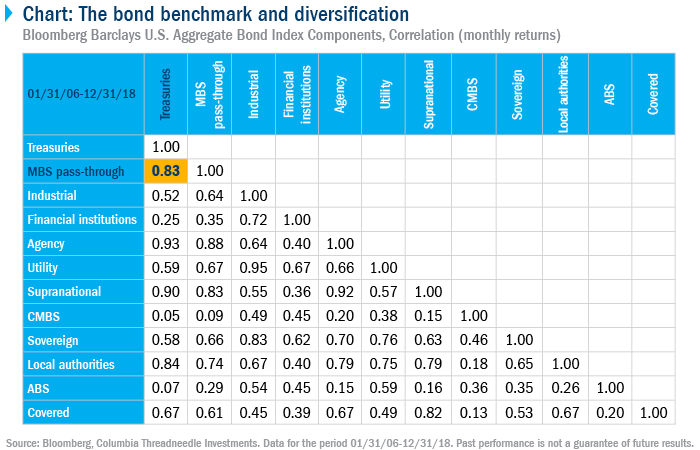 The correlation of the top two components, U.S. Treasuries and MBS, is 83% with minimal exposure to those components with low cross-correlations. The Bloomberg Barclays U.S. Aggregate Bond Index is a broad-based benchmark that measures the investment-grade, U.S. dollar-denominated, fixed-rate taxable bond market. The index includes Treasuries, government-related and corporate securities, MBS (agency fixed-rate and hybrid ARM pass-throughs), ABS and CMBS (agency and non-agency). It is not possible to invest directly in an index. Correlation is a statistic that measures the degree to which two asset classes move in relation to each other. The degree of correlation is represented by the correlation coefficient, which has a value that must fall between -1 and 1. A correlation of 1 means the asset classes move in lock-step. A correlation of -1 means the asset classes move in opposite directions.